Approximately 2.7 million grandparents are currently raising grandchildren and that number is expected to go up, according to PBS. The number of grandparents raising their grandchildren increased seven percent since 2009. Some experts studying this issue anticipate the numbers to spike given the opiate epidemic that is ravaging many communities across the country. For example, after years of declines, the number of children in foster care increased by nearly one percent in 2013 and over three percent in 2014. Military deployment and a growth in the number of women incarcerated are other factors causing grandparents to assume the role of parents once more. So what happens when a grandparent, or grandparents, are raising their grandchildren successfully and, suddenly, custody is challenged? This can create strife and discord in the life of the grandchild. Grandparents, with the assistance of experienced Houston family law lawyers, can petition a court for custody, possession or visitation rights to preserve their relationships with their grandchildren. The cold hard truth is that, as a grandparent, it can be extremely difficult to obtain custody of your grandchild, especially when the grandchild’s birth parent is seeking custody. 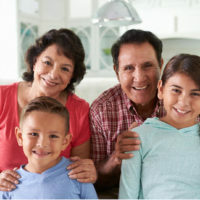 Under Texas law, in order for a grandparent to obtain custody of their grandchild, they must present sufficient evidence that the parents are unfit to care for the child or that the mental, physical or emotional health and well-being of the grandchild would be put in jeopardy by living with their birth parents. If you decide to pursue custody, you will hear the phrase “best interests of the child” quite often. All custody and visitation issues are analyzed under the best interests of the child standard. This means that you must be able to show that your absence from your grandchild’s life will have a negative impact on their emotional development. The child has lived with their grandparents for six months or more in the two-year period before filing an application with the court. For a consultation concerning your custody or visitation matter, contact the lawyers at Lindamood & Robinson, P.C. We serve clients throughout Harris, Houston and Galveston counties in southeast Texas and are ready to help you.